Are you looking for a way to help your dollar stretch a little bit further? There are a number of websites out there claiming to provide you with a way to make easy money. Most of these websites, however, require you to spend a large amount of time completing mundane tasks for a small amount of rewards points. Most of these types of sites aren’t worth what you put into them. There are a few that are worth pursuing. One of those is Swagbucks. The first thing people wonder when they hear about sites like this is, are they legit? The good news for you is that it is. Swagbucks is a legitimate consumer rewards site. You can earn points for doing everyday online activities, including shopping at your regular stores. The points are called SB. You can redeem your SB for cash and gift cards to some of the most desirable retailers in Canada, including iTunes, amazon.ca, Starbucks, and many others. It’s also possible to turn your SB into cash via PayPal. Over the years, Swagbucks users have turned in their SB for more than $120 million in cash and gift cards. That’s a pretty good amount for a site where people do simple tasks to earn points. Swagbucks isn’t known just in Canada and the United States. This is a global brand that has been around since 2008. Not only is Swagbucks showing some staying power, but it has also been issued an A+ rating from the Better Business Bureau. While people have had issues, you don’t receive an A+ rating unless you are totally legit. The first way to earn money with Swagbucks is to share your opinion. The fastest way to do this is to participate in the Daily Poll held over at the swag bucks main page. You can earn one SB simply by answering a question about any number of subjects, including your favorite color or whether or not you filled out a March Madness bracket. This is a quick poll that just about anyone can do without any trouble at all. You can also answer surveys. There are a number of surveys that are offered at various times and you can earn anywhere between 40 and 300 SBs just for sharing what you think. If you do sign up for a survey and you don’t qualify or survey is already full, you will still receive one SB. One of the best things you can do to earn SB faster is to shop through Swagbucks. You can get ahead if you only shop at your a regular online retailers, if you only buy what you planned to. You can earn up to 15% cash back (many of the offers I see are are 1-7%) in the form of SB when you shop this way. This is a good way to get money back on things you would purchase no matter what. Pay attention to the holiday season when many retailers run sales and offer double or triple the amount for selected offers. You can watch videos from leading sites all over the world and earn SB. This is one of the easier ways to earn SB because you get her between one and four for every set of video clips you watch. This can be slow going, but if you are careful you can earn SB by running videos in the background while you do something else. The SBTV and Yowgo apps can make this even easier, allowing you to watch videos on the go and earn even more points. You can also earn SB by completing regular Internet searches through Swagbucks, which is powered by Yahoo. Depending on your search, and what is happening that day, you can earn anywhere between 4 and 30 SB. These SB are awarded randomly. It’s even possible to change your default search to swag bucks so that you can earn without even thinking about it. Swag bucks has a section called Discover. This allows you to look around and find new products and services. This is also a deal section. You can see a number of deals as well as complete the various activities to receive SB for what you have done. If you only get deals for things that you would buy anyway, this can lead to stacking your savings. You do need to be careful with this one, though, because while you might earn a large number of SB for signing up for a free trial offer, you still have to provide your credit card number and if you forget to cancel you could find yourself paying for a product or service they don’t actually want to keep. Create a reminder that helps you know when to cancel a trial offer before you are charged. Do you like playing games? If so, you’ve come to the right place. You can earn more SB when you play games, including Bejeweled Blitz, Scrabble Clues, Wheel of Fortune and more. Depending on the game, you can earn between one and 10 SB when you buy tokens on the Game Show Network (GSN). You aren’t going to get rich playing games on Swagbucks, but if you’re going to play these games anyway you might as well get something. One of the best ways to earn SB without doing anything, is to make referrals. When you make a referral, you earn 10% of everything the people you have referred earn. Since these referrals last for life, with no caps on earnings, that can add to your SB balance pretty quickly. By following a few of the strategies each day, it’s possible to earn hundreds of dollars’ worth of gift cards and PayPal deposits each year. Use the Swagbucks app to get extra points through mobile. This is a great way to ensure that you can earn SB no matter where you are. I may be at a computer all day, but you probably aren’t. Being able to earn SB during boring times like when you’re in a meeting or standing in the grocery line, can make your time in little more profitable. Download the SwagButton extension. This can go in your chrome browser. It will alert you when there is a new SB code that provides you with extra points, and it will also help you easily get signed up to earn SB when you go to a partner retailer site. Get your first $25 gift card for the month for 2200 SB instead of the regular 2500 SB. If you can earn that many in a month, it can help compound your savings. If you want a simple way to earn a little extra cash while you’re at your computer, I recommend that you sign up for Swagbucks. I spend about $2K per month on my credit card, and get credits worth about 1.5% of the total spent. These credits work out to 1% if I elect to take cash, and more than 1% if I use the credits to buy plane tickets. If I understood you correctly, going through Swagbucks would earn me credits of 15% of the total spent. Is this correct? Would I get 15$% cash back if I so elected? And if I am paying by my credit card, I’d continue to get the 1.5% credit too, right? It is a no brainer since it’s only one extra click on your part, but there are some details I want to clear up. Since you have to click through from Swagbucks, it’s certainly only on online purchases, and only those that Swagbucks partners with. The other catch is that it’s up to 15%, many of the offers are lower. For example, if you click through from your Swagbucks account to shop at Amazon.ca, you’ll earn 2SB for every $1 spent. $500 would mean 1000 SB in your account. You can then cash those in for an Amazon.ca giftcard worth $10, therefor making it 2% cashback. And yes, you still get your credit card rewards as well. If you went on Swagbucks and bought something on something like Groupon, the deals could really stack… the Groupon deal itself might be 50% off, then you also get your 1-1.5% on your credit card, then their 7SB per $1 (as of today) would equal 7% cash back in a gift card from Amazon, Old Navy, restaurants, etc. Great article on Swagbucks. 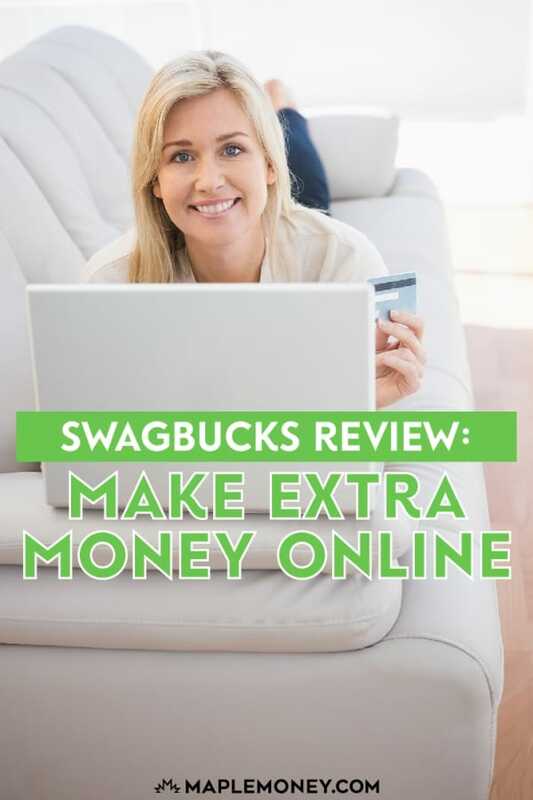 As per my study, Swagbucks is the most legit survey site out there, and it also gives various earning opportunities in the form of surveys, viewing videos, playing games, searching on the web, and referral commission. If you work on other favorite survey sites like Global Test Market, Inbox Dollars, and Prize Rebel you can anticipate earning between $10 to $30 per month. On the other side, I have seen people can comfortably earn between $40 to $60 per month with Swagbucks. It has also paid over $280 million to its members. The great thing is you are performing the same tasks as were doing before but now for the sake of money. Thanks. I tried Swagbucks………when I tried to cash in my credits, I was told they had expired. Geez – lots of time spent on surveys for nothing. Not impressed.